Genuine log cabin and pond on 23 acres awaits you as a destination unto itself or an ideal place to stay for visits to Bethel Woods, Callicoon, Narrowsburg, and other Sullivan County towns. - some fish, mostly bass & pickerel, nothing more than a foot long. - we allow catch and release--preferably with barbless hooks. Check-in/ Check-out is flexible, depending on availability. We prefer to greet our guests but if our schedules don't jive there is keyless access with a code unique to you. We provide you with a selection of restaurants in the area as well as places you can get groceries. We live less than 15 minutes away so if there is anything you need, just let us know! The Getaway at Moonrise Pond is ideal for visits to Sullivan County for a show at Bethel Woods, enjoying the Delaware River, and the many small upstate NY towns such as Narrowsburg, Callicoon, and Livingston Manor. Large lawn with swingset/sliding board. Outdoor games (Bocce ball, KanJam, Ladderball, Beanbag Toss, Paddleball, volleyball, frisbee), Hammock. Private Pond. 150ft dia. 15ft deep16x10ft dock. 2 kayaks. Tubes. Fish/catch&release. Swim at own risk. Life jackets supplied. No children in/around pond w/out adults. Covered area with 6-person hot tub and seating area. Uncovered area with person table and gas grill. 2 kayaks. Life jackets provided. Please, no glass, no eating in the tub. If you are outside barefoot, please rinse your feet in the outside shower. 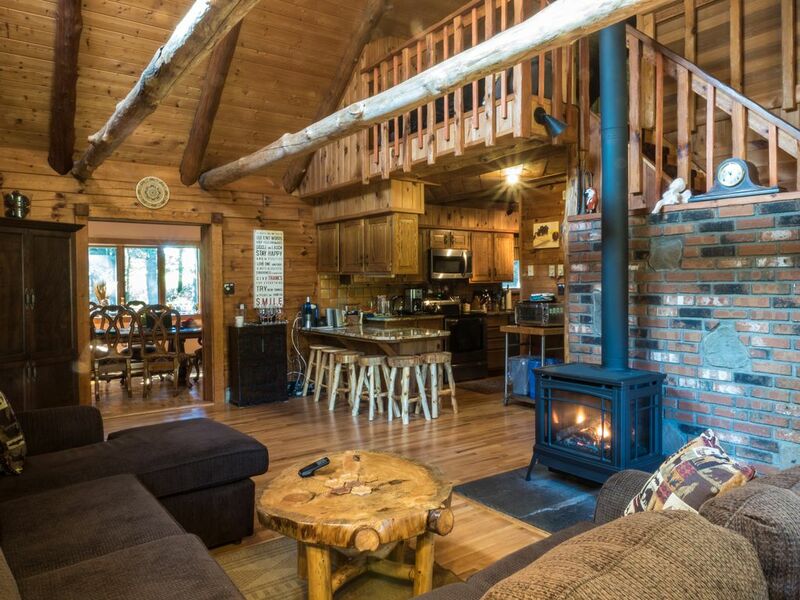 Perfect cabin to relax on the weekend! I just want first to say thank you Julie and Bill for being great host! Once we pull up to the driveway they were there to greet us which was very nice! The cabin was well taking care of and very clean which was great for my 9 month old to crawl around. The cabin was well stock with bankets, paper goods and a fully stocked kitchen. We were lucky to have beautiful weather and my kids enjoyed playing outside on the swing set. We also enjoyed grilling steaks and burgers on the deck overlooking the pond and we really loved relaxing at night in the Jacuzzi and having a glass of wine around the firepit! The other couple that were staying with us forgot their cell phone and Julie and Bill were kind enough to go back to the cabin to find it and mail it out to us. This was a wonderful cabin and we can't wait to come back! Had a wonderful time during my stay. Bill greeted us and gave a walkthough of the property even though I checked in late. House was clean and well maintained. Unfortunately, the weather was not suitable for any outdoor activities but I am sure the place will be exciting during summer with lots of lakes and trails to explore. Would highly recommend for someone looking for a quiet getaway. Don't hesitate, just book it! It's a gem! We had a great time. The owners will greet you and on top of providing all the details of the home and surrounding area in writing they will take the time to tell you. Julie greeted us and informed us of all we needed to know. The home is beautiful and peaceful. We enjoyed every aspect of it. Can't wait to go back in the warmer months. Fire pit is great, jacuzzi is brand new. Excellent home...fully stocked....lot's of spaces to relax...pond view amazing...Bill was very welcoming. Highly recommend!!! The property is really nice, with a private pond and wooded surroundings. Although a light rain fell for most of our 48 hour getaway we still managed to spend a lot of time kayaking and barbecuing under the eaves. Unfortunately we could not eat on the deck but the indoors is so spacious and welcoming that we really didn't mind. Between a side trip to Bethel Woods (the site of Woodstock and it's great museum) and a more than adequate supply of books and games we always found something to do. Bill greeted us at the door, showed us around and assured us that he would be available should we need him. We would definitely consider a return trip.